Faith & Politics ALWAYS intersect. Just a place to post my political reflections. What do you think the role of government should be? That is a BIG question with a LOT of answers. Most likely, your answer will be determined by your political persuasion. The Libertarian ideal is a highly limited central government with minimal intrusion into the lives of everyday citizens. Pure Libertarians value a government whose primary role is protecting individuals from coercion and violence. Some Libertarians border on anarchists, advocating for the dissolution of the State all together. The other extreme of the political spectrum are those who advocate a very strong central government that closely monitors the affairs of its citizens, limits their freedoms, and is in charge of the day to day operations of the society. Whenever someone is accused of being a socialist, it is because they believe the best form of government is the one that has the most control. In between the Communist State and the Libertarian Anti-State, you will find most people. And while we may all have our own opinions about this particular issue, especially as it is hashed out in the public square of our nation today, it would be wise for us to consider the fact that God has already established His divine plan for government. Before we form our opinions based on political persuasion, we would do well to form our opinions based on what God has already said. Remember, our first loyalty is to Christ. As Paul said in 1 Corinthians 2:16, “We have the mind of Christ.” This means that what He says in His Word is the most important guiding principle of our lives. So, what does God say about government? Peter has some very interesting words for us today and they are perfectly relevant to the conversation going on in our own land. 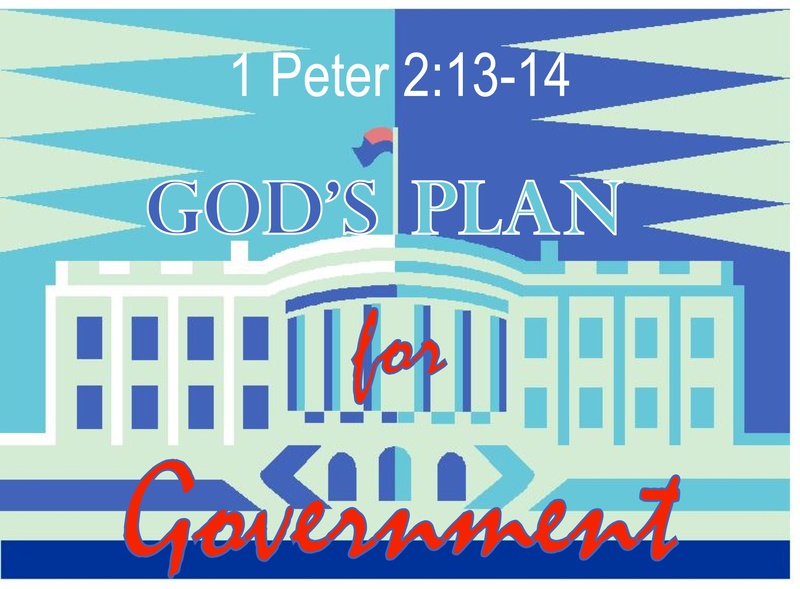 In 1 Peter 2:14, Peter says that the main role of government is to punish evil and praise good. Paul affirms this in Romans 13. Simply stated, it is the government’s job to ensure that a virtuous society can flourish. One could easily make the case that this seems to be the intent of the Declaration of Independence when it says, “We hold these truths to be self-evident, that all men are created equal, that they are endowed by their Creator with certain unalienable Rights, that among these are Life, Liberty and the pursuit of Happiness.” Though imperfect men, our Founders understood something of God’s intent. So, they structured a government that was accountable to the people and limited in scope. Those powers not given to the central state were left up to the states and municipalities to decide. Our great problem today is that we no longer have a clear understanding of virtue and evil in our culture. Things that God has said are evil are now being considered permissible – even preferred in some respects. A government cannot do its God-ordained function if it embraces moral relativism because evil is no longer identifiable. As Christians, we must recognize the dangerous ground in which we live, but still strive to be good citizens. There may in fact come a day when the state not only sides with evil, but requires evil of its citizens. On that day, our citizenship in this sphere will be revoked because our number one allegiance is not to the United States of America, but to the Kingdom of God! While we may honor the emperor as Peter says, we must always remember that we surrender to the KING of KINGS and the LORD of LORDS. I saw a truck the other day that must have had an interesting story. It was seriously rusted. It was “don’t go down a road that is too bumpy or I’ll fall apart” rusty. It looked like it had sat somewhere for a very long time – especially considering that the truck had an actual tree trunk grown around its bumper. Someone literally had to cut this truck out of a tree in order to reclaim it. To tell the truth, if I ran across that truck in the woods, I don’t know that I would have gone through the effort to reclaim it. There are some things that are simply too broken to try to fix. I’ll be honest – sometimes I feel that way about our country. I look at the gulf that seems to separate conservatives and liberals, Christians and non-Christians, and I wonder if there’s any way to fix what is broken, or is it too far gone? The fact of the matter is that Christians may be to blame for some of the breakdowns that we are seeing in our culture. Allow me to explain. In the last couple of centuries, Christianity has been the dominant force in American culture. As a result, we’ve done our best to make our moral convictions the “law of the land.” This is why we have blue laws still on the books. But in legislating morality, we have not been diligent in turning the corner between the requirement of moral behavior and Christian discipleship. The result is a society that is nominally Christian and a legal code that is divorced from the moral standard that led to its implementation. Bottom line is this: you cannot legislate morality and expect people to be good. Sinful hearts are sinful even if the law says otherwise, and government cannot preach repentance. A moral society is more than just the sum of its laws; the hearts of the citizens must be inclined to the Lord. In 2 Kings 22-23, we find the story of King Josiah. He was a moral king. He ruled with righteousness and integrity. And he is the KING of moral legislation. He enacted sweeping reforms that required people to worship the LORD exclusively. His reforms make modern blue laws look liberal! The only problem is that as soon as he died in battle, the people returned to their old ways. Bottom line is that the nation experienced moral reform without a change of heart. Christians today should pay attention to this very important principle. Though we should champion legislation established from a Judeo-Christian ethic, those laws cannot change the nation without a necessary change of heart. Christians are uniquely suited to help with this. That is what the Gospel is all about, after all. The Gospel does what no government ever could; it transforms the hearts of the people. 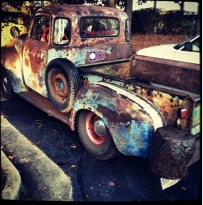 Christians can look at our culture like that truck stuck in the tree trunk. We can say that the whole thing is too broken to fix, wash our hands of it, and leave it to rot. Or, we can do what the owner of the truck did, carefully reclaim it from the trap, and through the Gospel, see righteousness restored and a nation exalted. I’m not yet convinced that it is too broken to fix, but the clock is certainly ticking! Aren’t you glad you live in Georgia? They tell me that living in a “swing state” is miserable in election years. The radio & television ads are non-stop, the billboards are everywhere, the campaign mass mailings are relentless, and the door-to-door visits are all too frequent. Georgia, they say, is a foregone conclusion. No need to have the election. Just color us red on the map and come back again in a few years. One poll of likely voters in Georgia turns us red by 21%, although it is probably closer to 10% or so. No matter, the campaigns have largely avoided our state with both their “ground war” and their “air war.” Georgia is so much a foregone conclusion that the major media outlets will not be conducting exit polling in our state. They see no need in asking a red state why they choose to remain red. Much more news is to be made in swing states, so they’ve put their news eggs into purple baskets like Florida, Ohio, and North Carolina. If you’re a Christian, it makes no matter if you live in a swing state like Pennsylvania, a red state like Georgia, or a blue state like New York. A biblical worldview is consistent across geography regardless of the political ideology of the place you call home. This means the biggest influence of Christians – whether they live in Meriwether County or Manhattan – had better be the Word of God. This also means that there are certain non-negotiable issues that should be near and dear to the heart of Christians, because they are near and dear to the heart of God. Many Christians have washed their hands of the political process. It feels that we are often left having to choose the lesser of two evils. To be perfectly honest, I feel this way about our presidential choices this year. I’m being asked to choose between a religious pluralist and a missionary from the Mormon Church. On one hand, President Obama has done more in his four years to suppress religious freedom than any president before him. On the other hand, Governor Romney practices a religion that most evangelicals – myself included – consider a cult. As a former missionary, he actively proselytized for the Mormon Church. He also supports the work of the church with large sums of money. I’ve heard some say that I shouldn’t worry about such things because “I’m not voting for a pastor.” I agree, because if this were the vote for my pastor, I would have to find a new church. The good news is that Jesus has given us clear instructions on how we should respond to our culture. In Matthew 5, Jesus tells us that believers are called to be “salt and light” in our world. This really is simple, straightforward advice on how He wants us to live our lives. We are to be influencers in our culture. And it just so happens, in a free society such as these United States, the greatest influence can be felt at the ballot box. What does it mean to be salt and light? Salt is a preservative. In other words, salt prevents decay. Christians should work to stop the decay of our society. I believe this means moral and ethical decay. When we see decay, we must do our part to stop it. That’s what being salt is all about. Light exists to erase darkness. Christians must constantly look out for darkness and shine the light of truth on it. Things hidden in darkness are completely revealed when light is shined on them. Remembering those two simple things helps me be a better Christian voter. When I vote, I must discern which candidates or political parties will do the best at stopping moral and ethical decay and which will shine light on darkness. At the same time, I cannot trust politicians to do my job of being salt and light. They may govern in such a way that reinforces my worldview, but they cannot change the hearts of those they govern. Only Jesus can do that. While you may have great hope that your candidate will win in November, your candidate cannot change your coworker or your family member. Jesus is counting on us to be salt and light in our own spheres as well. True change for a culture comes when citizens’ hearts are turned to Christ, not just their government. There is one doctor who is a household name. No, I am not talking about Dr. Phil, or even Dr. Spock. You could very quickly recall his name if someone in your home began to choke on a foreign object. You would quickly spring into action, most likely performing what we know as the Heimlich Maneuver. Though I have never had to be the administrator, nor the recipient of this “maneuver,” if administered correctly, it is supposedly an effective way of clearing the airway of a choking victim. What is interesting about the Heimlich Maneuver is that it is named after Cincinnati physician, Dr. Henry Heimlich. The “maneuver” was first advocated by Heimlich in 1974. Prior to this, the application of back blows was the acceptable practice for clearing obstructed airways. However, this method often caused foreign objects to drop deeper in the airway, worsening the situation. Since 1974, countless choking victims have been saved thanks to the Heimlich Maneuver. However, if you ask Henry’s son, Peter, he will tell you that the Heimlich Maneuver should actually be called the Patrick Maneuver, claiming that his father stole the procedure from colleague, Edward Patrick. Peter claims that the only maneuver his father can take credit for is maneuvering his own reputation. In fact, Dr. Heimlich’s latest medical crusade is HIV research. In a highly controversial procedure, known as Malariotherapy, HIV patients are injected with malaria-infected blood. This highly dangerous procedure has been widely criticized by the established medical community as a deadly course of treatment. It is no wonder that these procedures have primarily been conducted in Ethiopia and other developing nations, outside the oversight of governing bodies. Dr. Heimlich has taken his crusade to Hollywood, raising millions of dollars for his controversial research on the fame of his last name. Peter claims that all of his father’s medical accomplishments have been proven to be quack medicine or stolen from colleagues. Isn’t it interesting that the guy known for saving the lives of choking victims may himself be choking? In Mark 4, Jesus spoke of the risk of sowing good seed in thorny ground. While the seed may germinate and grow, Jesus said that those plants are choked by the “worries of this age, the seduction of wealth, and the desires for other things.” Who knows if anyone has ever shared the gospel with Dr. Heimlich, but if his son’s criticism is right, there may be a lot of thorns in his life that would keep the gospel from bearing fruit. What about your life? Are there thorns in your life that are keeping the gospel from bearing fruit? Is your lifeline being choked by worries, wealth, and other distractions? Truth be told, if a plant is worth saving, the only course of action to rescue that plant that is being choked by thorns is the bloody process of removing the thorns. Jesus knows a little something about thorns. He knows something about blood too. All those sinful thorns in my life, they have been pulled by a bloody hand, and trampled on by a bloody foot. So when my fruit is diminished because I am being choked by my thorns, I would do well to look at the crown placed upon my Lord’s head during his passion – a crown made of the very thing that threatens my fruitfulness – a crown of thorns. Why I ever allow thorns in my life I may never know, but I am so grateful for a God who has provided the maneuver to keep me from choking in my own thorns. Lincoln was right. Though it required a bloody civil war to settle the differences, the union would endure and the division would cease. Or would it? As a Christian citizen of this country, I would be lying if I did not express some concern about the issues faced by this country. Though we have settled the issue of slavery, it seems that we are facing divisions today that go far beyond political ideologies, though they are very much political. The divisions we face today rest at the heart of our culture. And in so many ways, our divisions are a ticking bomb waiting to explode. 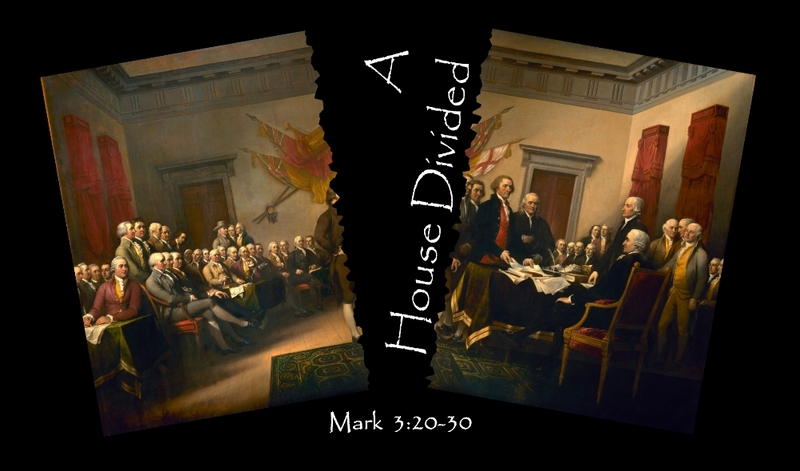 How divided must the house become before a tipping point is reached? Even this week, we have seen this division deepen as yet another state – this time New York – has legalized Soddomite marriages. That means that 20% of the states allow this mockery of marriage. If you look at a map of the states that ban this practice and the states that condone this practice, it is starting to look a lot like the map of slave states and free states in 1861 – only this time the Southern states are clearly in the right. Perhaps the nation will endure the division over Soddomite marriages. What about the division over fiscal politics? This is yet another point of great contention in our nation. How far can the division go before something dramatic happens? Ultimately, Lincoln was right on all counts regarding the efficacy of a divided nation – it simply cannot stand. But, as it turns out, Lincoln had a good teacher. Jesus said this long before Lincoln. In Mark 3, Jesus reminded his critics of this foundational truth as they accused him of driving out demons with Satan’s power. Obviously this was a foolish argument as Satan wouldn’t last very long if he behaved this way. But the principle of division is true in every aspect of our lives. It is true on a national level in our politics, but it is also true on a local level in our homes and our churches. A house divided cannot stand. As the church of this great nation, we must face the division of our politics with a unity in our purpose. Though we may vehemently disagree with the direction our nation is taking, we must still be salt and light in a very dark and divided land. We know that the only solution to our ills is Christ. And we must be firmly committed to bringing him to our neighbors and our nation. Not so we can save the union, but so Christ can save all of us from our sinful selves.